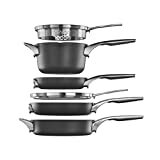 Best Non-Stick Cookware Set in 2019 | Top 5 rated and reviewed. 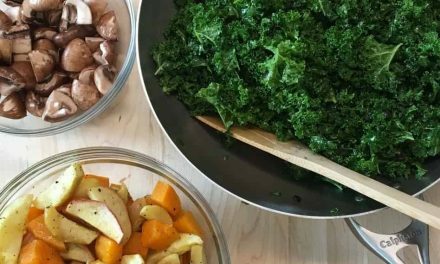 Non-stick cookware has many benefits. First of all, non-stick pans allow you to use less oil when cooking which is a big advantage if you are a health-conscious cook. Furthermore, non-stick cookware is incredibly versatile. You can literally use it to cook anything. Besides, non-stick pans are just the best option available when it comes to cooking certain types of foods. 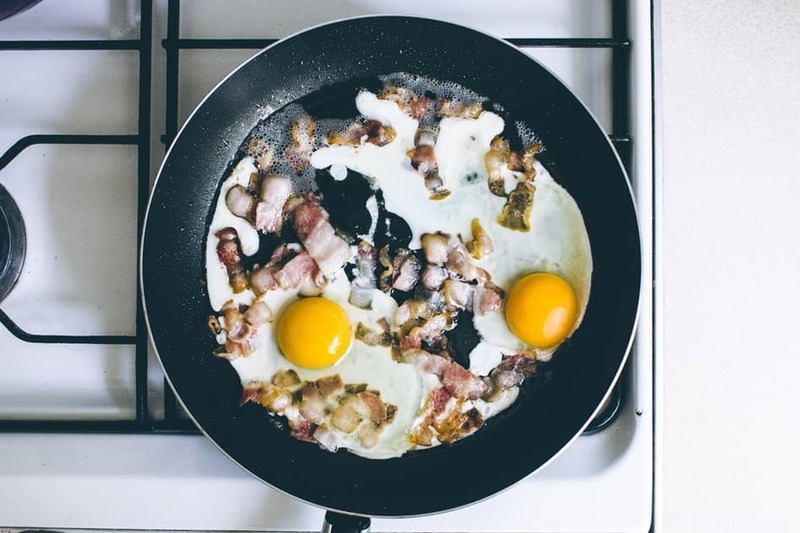 Have you tried cooking eggs on a non-stick pan? It is absolutely the best way to do it! Finally, another advantage of non-stick cookware is the fact that it usually comes at a lower price compared to stainless steel or copper cookware. If you are just moving in into a new apartment, for example, and want to get all the equipment you need for your kitchen, this can be very important. We’ve looked through all the non-stick cookware sets available online, and we can tell you there is truly a lot to choose from? But how do you know which ones are worth getting? No one wants low-quality cookware that starts falling apart after a month of use, after all. This is why our top-5 list is here. We’ve researched and tested some of the most popular options, weighed out the pros and cons, and came up with this list of 5 great options. Read on if you want to find out what they are. The Farberware High Performance Nonstick Aluminum 17-Piece Cookware Set is a large cookware set that comes with everything you might need in your kitchen if you are just starting out on your own. Moreover, all of this comes at an amazingly low price, so if you are looking for a beginner cookware set that won’t burn a hole in your pocket, this might be it. So what exactly does the set contain? First of all, there are two saucepans. The smaller one has a capacity of 1 quart which is the perfect size when making soup for one, heating water for tea, or heating up milk to make cocoa, for example. The larger 2-quart saucepan allows you to make larger batches of anything. Furthermore, there is also a large 6-quart stockpot and a 3-quart saute pan included. However, this set includes much more than standard pots and pans. You also get an 8.5-inch frying pan, and a large square griddle which is just perfect for pancakes! To complete the collection, you also get a large cookie pan and six Prestige nylon cooking utensils – a solid spoon, a slotted spoon, a slotted turner, a pasta fork, a ladle, and a whisk. 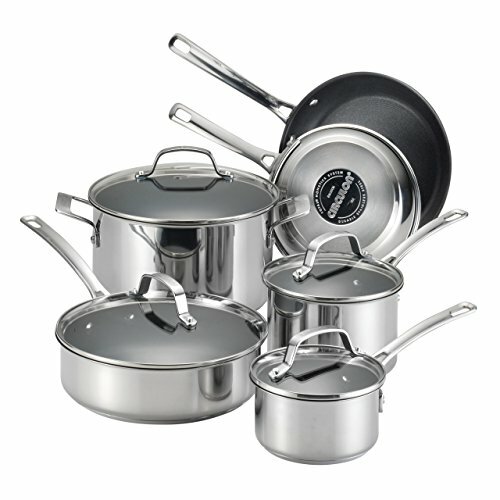 All the pots and pans in this set boast a heavy-duty aluminum construction with non-stick coating on the inside. The frying pans and the griddle also feature a dimpled cooking surface which makes food release even better. The non-stick coating on all pots and pans in the set is a special SmartGlide non-stick system from Farberware that uses DuPont Teflon Plus, which is arguably the best non-stick coating out there. Using metal utensils with this coating is not recommended, but if you consider the number of nylon utensils you get in this set, you really have nothing to worry about. The cookware can be used in the oven on temperatures up to 350 degrees Fahrenheit, put the cookie pan can take temperatures up to 450 degrees Fahrenheit, so you can really use it to bake anything you want. The exterior of these pots and pans is very easy to clean. You can choose between five different colors for the exterior – Acqua, Black, Champagne, Copper, or Red. We love adding a dash of color to the kitchen with cookware, and so will you. However, if you prefer to stick with classic black that is also an option! This set really includes anything you might need to prepare a complete and tasty meal which makes it great for setting up an apartment. It also comes at quite a reasonable price, so it’s a perfect set for those looking for a functional set of cookware on a tight budget. 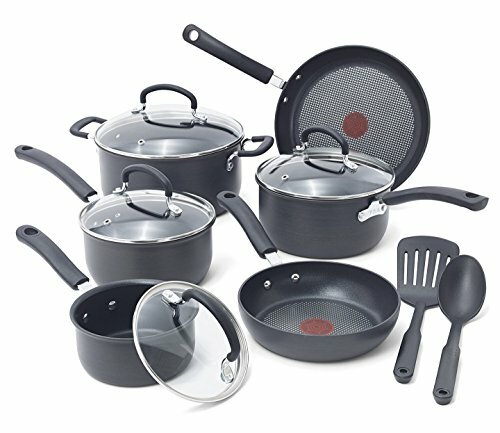 The composition of the T-fal E765SC Hard Anodized 12-Piece Cookware Set is slightly different than other standard cookware sets. What immediately stands out is the fact that you get a 5-quart dutch oven. The dutch oven comes with a glass lid that fits snuggly which makes it perfect for slow cooking both on the stove and in the oven. Besides the Dutch oven, the T-fal E765SC Hard Anodized 12-Piece Cookware Set set also includes 2 sturdy frying pans and three saucepans. The diameter of the smaller frying pan is 8 inches, while the diameter of the bigger one is 10.25 inches. Both are very good sizes for standard home cooking needs – not too big and not too small. The three saucepans included are all in different sizes. The capacity of the smallest one is 1 quart, the middle one is 2 quarts, and the large one is 3 quarts. All three saucepans have nice long double-riveted handles with a silicone cover. The silicone is heat resistant (up to 350 degrees Fahrenheit), but it also remains cool to the touch which is great. As a nice addition, you also get a serving spoon and a slotted spatula in this set, so you truly have anything you need to cook a complete meal. s your pan heats up, the circle changes color and the pattern gradually disappears. Once the circle is completely red, you know that your pan has reached the cooking temperature. 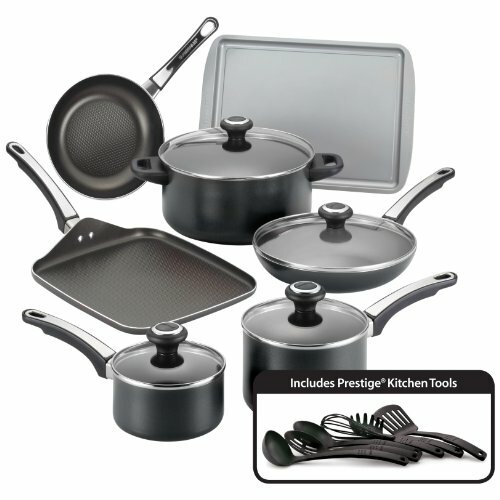 The T-fal E765SC Hard Anodized 12-Piece Cookware Set is a very functional cookware set. The cookware is very well-constructed, but it also comes at a reasonable price. It’s really a good choice if you are looking for an all-purpose cookware set for everyday use and definitely a runner for the title of the best-rated cookware set overall. The Cuisinart 66-11 Chef’s Classic Nonstick Hard-Anodized 11-Piece Cookware Set is another highly functional and versatile non-stick cookware set. It includes two saucepans, a large stockpot, a saute pan, and two frying pans in different sizes. As a nice addition, a stainless steel steamer insert is also included in the set. The saucepans need lids, of course. Regarding lids, you get a total of four tempered glass lids with stainless steel handles. Even though there are six pots and pans altogether, you really need only four lids since the two biggest lids fit on the stockpot and the saute pan, respectively, but they also fit the two frying pans. All the pots and pans included in this set are made of hard anodized aluminum which is arguably one of the best materials when it comes to cookware sets for everyday home cooking use. The exterior of the pots and pans has a nice graphite finish which gives them an elegant look. Furthermore, all the pots and pans also have a heavy aluminum base which allows them to heat up evenly without hotspots. Aluminum is among the best heat conductors, so the also heat up really quickly. When it comes to the inside layer, the cooking surface is covered with a quantanium non-stick coating which is reinforced with titanium. This innovative non-stick coating is unique to Cuisinart and it’s quite durable and reliable. It provides amazing food release and it doesn’t get damaged easily. You can even use metal utensils without worrying about scratches. All the pieces in the set also include solid stainless steel handles which are oven-safe and quite stable. 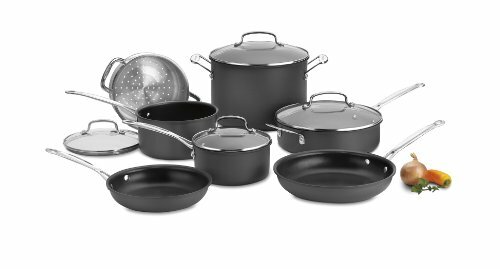 One thing that makes the Cuisinart 66-11 Chef’s Classic Nonstick Hard-Anodized 11-Piece Cookware Set stand out among the competition is the fact that every detail has been designed with care. The tapered rims on the pots and pans are proof of this. The rims are slightly thicker at the top, which allows for drip-free pouring and makes the lids fit really tight. This 6-piece set is made heavy-duty hard anodized aluminum. 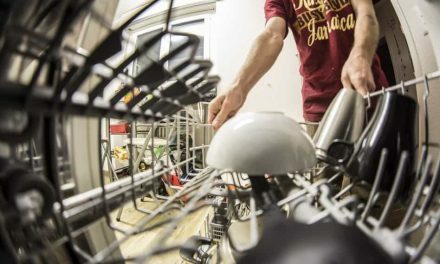 Thanks to the heavier construction, these pots and pans are a bit on the heavier side, but this also makes them extremely durable and impact-resistant. Furthermore, the aluminum core heats up quickly and distributes heat really evenly which is great. 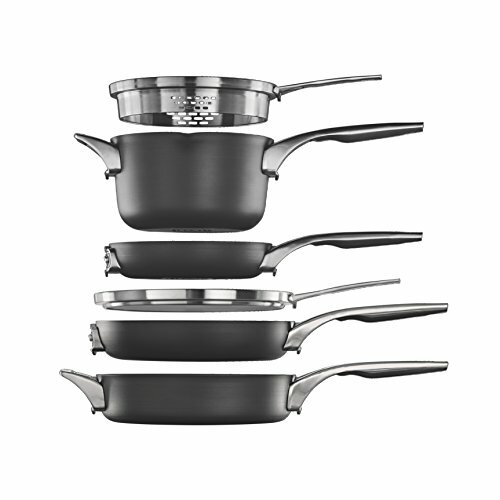 However, the best thing about Calphalon cookware is probably the special 3-layered non-stick interior coating. It is extremely scratch-resistant so you can even use metal utensils when cooking which is not always the case with non-stick cookware. You can also wash all the pieces from this set in the dishwasher, which makes life much easier. 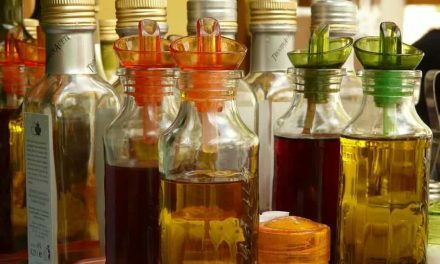 Most importantly, your food will slide right off the pot or pan even if you don’t use much oil. Finally, Calphalon cookware is certainly not the cheapest on the market, but they do make high-quality products that can last a lifetime. And if they don’t – Calphalon actually gives you a lifetime warranty on all of their pots and pans. Thanks to the stackable design, this sat from Calphalon is certainly among the best non-stick cookware sets for people who have to deal with limited space in their kitchen. Even though there are only 6 pieces, this set offers everything you need in order to cook for a small family, and if this is not enough, they also offer a 15-piece set. Moreover, you can also buy additional pieces separately. If you get the same diameter, you’ll be able to stack them with your set. 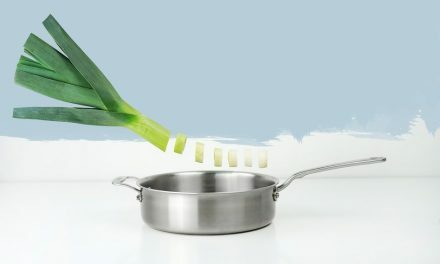 Even though aluminum is the most common material used in non-stick cookware, it is certainly not the only option. The Circulon Genesis Stainless Steel Nonstick 10-Piece Cookware Set brings stainless steel to the world of non-stick. This way, you get the durability and resistance of stainless steel, but the non-stick coating allows for easy cleanup and oil-less cooking. However, stainless steel is not the best heat conductor. It heats up much slower than aluminum, but Circulon has found a solution to this problem. All the pots and pans in this set come with aluminum cores in their bases sandwiched between stainless steel layers. Thanks to the aluminum core, these pots and pans heat up really quickly and distribute heat evenly, without hotspots while the stainless steel exterior keeps them resistant to rust, scratching, and any kind of damage. The interior is covered with a non-stick coating, but not just any kind of coating. It is Circulon’s TOTAL Food Release System which is PFOA-free, sturdy, and scratch-resistant which means you can safely use metal utensils with this cookware. It works just like ordinary stainless steel, but the food will never stick to the surface. Instead, it slides right off. So what exactly do you get in this set? The Circulon Genesis Stainless Steel Nonstick 10-Piece Cookware Set includes two saucepans in different sizes a 2-quart saute pan, a large stockpot, and two frying pans. The smaller pan has a diameter of 8.5 inches, which makes it perfect for frying eggs or making omelets. The large frying pan is 10 inches wide. The two saucepans, the saute pan and the stock pot come with tightly fitting transparent lids made of shatter-resistant tempered glass with stainless steel handles. Since all parts are made either of stainless steel or of tempered glass, you can safely put any piece of cookware from this set into the oven. It can stand temperatures up to 500 degrees Fahrenheit. Finally, the Circulon Genesis Stainless Steel Nonstick 10-Piece Cookware Set is dishwasher-safe and compatible with all kinds of stovetops, even induction. The Circulon Genesis Stainless Steel Nonstick Cookware Set is functional, durable, and versatile. It includes everything you might need for preparing a meal, no matter how many mouths you need to feed. It comes at quite an affordable price, but it has also received many good reviews. It might just be the best-rated non-stick cookware set available. What is the best non-stick cookware set? It’s hard to say. The perfect cookware set is the one that fulfils your daily cooking needs just right. You don’t want to have pots and pans that take up a lot of space in your kitchen, but you somehow never use them. If you really want to save on space and have no idea where to put all the lids, the Calphalon Premier Space Saving Nonstick 6 Piece Set offers a great solution. Since everything is stackable, this set takes up only half of the space this number of pots and pans would take up otherwise. On the other hand, if you are on a tight budget but want a cookware set that contains everything you need for cooking breakfast, lunch, dinner, and dessert on a daily basis, the Farberware High Performance Nonstick Aluminum 17-Piece Cookware Set might be a good solution. It even includes a cookie pan for baking and a set of cooking utensils, so you truly have everything you need. In conclusion, finding the right cookware set is not easy. We’ve gathered the information and now it’s up to you to weigh out the pros and cons and find the one that suits you best! The overall best cookware sets. Best non-stick cookware for glass stoves. Best non-stick cookware for indian cooking. Best non-stick frying pan for induction cooktops.